On the ice, Jack Eichel’s vision is a gift. His transcendent hockey skills are a combination of natural talent and repetition. His body, however, is the result of good genes, and good old-fashioned sweat equity. Countless hours in the weight room have layered muscle on Eichel's 6'1", 195-pound frame, allowing him to withstand the rigors of the game. The 18-year-old center from Boston University led the nation in scoring (26 goals, 45 assists, for 71 points), and was an astounding plus-51 on the season. In May, he became the first draft-eligible player in more than two decades—the last being former Buffalo Sabre great Phil Housley—to play for the United States in the IIHF World Championships (where he collected two goals, including an overtime game-winner, and seven points). Eichel, college hockey’s Hobey Baker winner, is generally considered a lock for the second overall pick, behind Canada’s Connor McDavid, in tonight’s NHL entry draft. But his body of work began years ago. “When I was younger, I was fascinated with becoming an explosive skater,” says Eichel, a Massachusetts native. “I wanted to be faster than everyone else on the ice. I think that’s one of the most important things in the game. 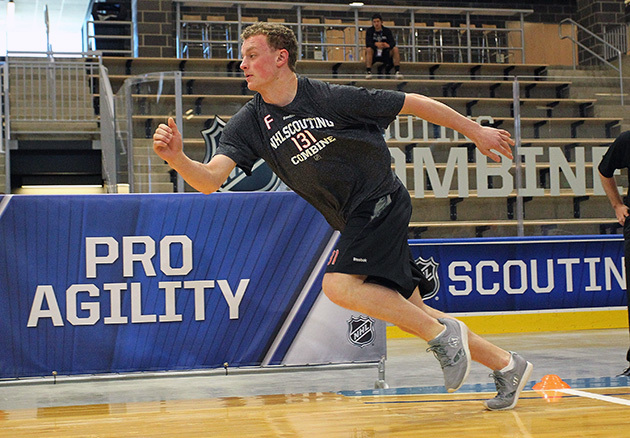 Eichel has a sturdy build, first developed with trainer Ben Bruno (now based in Los Angeles) and further refined at BU with strength and conditioning coach Anthony Morando. That frame, with thick legs and mid-section, enables the teenager to play his skill game while fending off larger opponents. ​“I looked at the weight room as a place where I could become a much better hockey player, and I thought it was a great opportunity to be stronger on pucks,” says Eichel. “You look at guys like Sidney Crosby and [Evgeni] Malkin and [Ryan] Getzlaf, and some of the better players in the NHL. [Joanthan] Toews, [Patrick] Kane. According to Morando, the goal of the BU strength staff was to keep Eichel and his teammates injury-free over the course of a six-month collegiate season. That’s easier said than done, says Morando, because of the both the physical nature of the game, and the unique stance the sport requires. 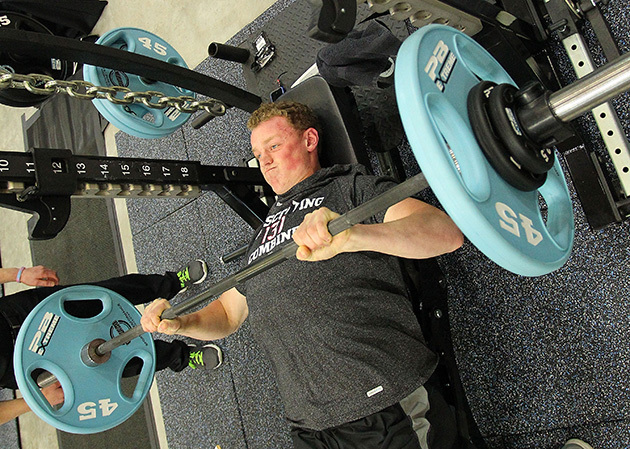 Dedication to the BU weight room helped the Terriers reach the NCAA championships game (where they lost to Hockey East rivals, Providence, 4-3). Not only did weight work create a strong sense of camaraderie, says Eichel, but it also allowed Morando to monitor the players, and address any concerns regarding muscle imbalance that could leave them susceptible to injury or prevent them from reaching their physical peaks. ​“It’s all about having constant attention to detail and assessment,” says Morando. Next year is still an open question for Eichel. As of late May, he still hadn’t made any decisions about whether he’ll leave school, regardless of where he is picked in the draft and what team makes that selection. But there’s little doubt that he has the talent to make the jump. “The sky’s the limit for Jack, because of his work ethic,” said BU coach Dave Quinn during last season. “He's so coachable, and he’s just so driven. When you put him in one-on-one situations, I don't know if I’ve been around as skilled a player who is as competitive as he is. If Eichel leaves for the NHL next year, consistency and injury prevention become even more important, since he’ll face a schedule twice as long as this past season's. And expectations will be high. “The team that gets Jack is going to be a needy team,” said Dan Bylsma of the Buffalo Sabres, who own the second pick in the draft, last December. “It’s going to be a team that is going to be near the bottom of the league. That’s certainly going to be a situation where they’re going to need an elite centerman. To battle those bumps, Eichel has three favorite exercises. All are considered full-body workouts, employing multiple large muscle groups: the power clean, the trap bar deadlift (also known as a hex bar deadlift), and the single-leg squat. Morando suggests adding a dumbbell pull to provide upper body balance to counteract hockey’s hunched posture. ​The trap bar deadlift uses a number of muscle groups, including legs and core, to enhance stability and acceleration. “If a player’s glutes and hamstrings are strong, they’re going to have more push on the ice,” says Morando. The trap bar itself, by providing a neutral grip from the side, allows the athlete to maintain better posture, as opposed to reaching forward, helping to avoid injury. The single-leg squat accentuates that hockey, while played on two feet (or skates), is defined by a skating stride that takes place one leg at a time. “Hockey is a quad-dominant sport,” says Morando. “The quads are going to need to be strong and forceful.” Plus, studies have shown that athletes can tax a single leg with more than half the weight of a two-legged squat, making this approach more efficient. Power Clean: With feet underneath the hips, and hands gripping the barbell slightly wider than shoulder width, lift the bar quickly, extending the hips, and shrugging slightly to get under the bar while landing in a partial squat. Bring the bar to the chest, pushing the elbows forward. Finish by standing with the bar. Reset. Trap Bar Deadlift: With feet directly underneath the hips, and toes pointing forward (to ensure proper knee tracking), squeeze shoulder blades together and, while keeping the head and chest up to ensure a neutral spine position, bend much like a squat to grab the trap bar with a centered grip, aligning hands with feet for a balanced stance. Push through the floor, lifting the trap bar with the hips and shoulders rising together at the same time. Shoulders, hips, knees and feet should all be properly "stacked." Single Leg Squat: From a standing position, stride forward with one foot, keeping the knee directly above the foot, while lowering the trailing knee to the floor. Keep head and chest up, to keep the spine neutral and concentrate on the core and quadriceps muscles. Graduate from unweighted squats to incorporating dumbbells to increase resistance. Elevating the rear foot will isolate the supporting quad and simultaneously challenge balance proprioceptors.